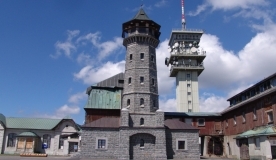 It provides a remarkable insight into the history of mining, the tour with a fascinating commentary will present to you the history of mining in the Jáchymov region where silver, coloured metals, but also uranium were mined. In the mineshaft you can see various types of timber support (wooden, steel, bolted), mining trucks, hand mining techniques (hammers, drilling hammers). The exposed part of the mineshaft is currently about 270 metres long. Entry to the mineshaft can be found close to the Royal Mint – you get to it following the blue tourist trail. For security reasons, the capacity is limited to approx. 20 visitors. Till April 30, reservations are neccessary to make a day in advance; there must be at least 5 people in a group. Admission is permitted to children from 5 years of age.